I think of myself as a “peasant cook” –not really sure how I came up with the term, it just feels right. I have learned since that there is an entire Facebook page dedicated to “peasant cooking”. Well, for me, the term captures the essence of using what is available, substituting liberally, usually ending up with a “one pot” meal (and a particular propensity for soups.) I think of peasant cooking as earthy, magical, and messy rather than beautiful, refined, and gourmet. For me it is a hands on sensual art that reverts to simple tools, rather than technology. I think of my kitchen as my hearth – a place where people gather for warmth and comfort, for good nourishing food, and to swap stories – and I like that it contains the word “heart” within it, because ultimately that is what cooking (and story telling) is for me–an expression and extension of love. I decided to offer myself encouragement–since it was obvious the need for cooking was not going to go away. Every day that I set dinner down on the table I made a little proclamation “Oh my goodness, can you believe it! I did it again – I actually made dinner and got it to the table! !” This caused some giggling from the half pints and as I continued day after day to make these proclamations at dinner, the whole idea caught on. Pretty soon, the kids were the ones who would say “Look Mom – you did it again! You fixed us a yummy dinner! !” That was the start. Then I discovered that all the allergies I had to contend with were a huge blessing in disguise for it led me down avenues I never would have considered and forced me to research, to get involved. I started investigating ethnic recipes – Mexican, Thai, Japanese, Ethiopian, Korean, Chinese, Latin American, German, Swedish, Dutch, Swiss — that focused on rice or corn or potatoes instead of wheat and bread; I wandered down health food aisles looking for alternatives to sugar, such as barley malt, fructose, cane juice and found also interesting grains like millet and quinoa, and vegetarian alternatives such as Quorn, tofu, tempeh. I began to look forward to cooking and started entering into the act of cooking with more intention and awareness. At some point during the day I would peruse recipes to get ideas. Then at 4 pm I would put on music, enter my kitchen and clean it – before I started cooking — I would announce to myself (or others if they were around) that I had to prepare my temple. What I found was that preparing myself and my kitchen this way helped me relax and really enjoy the task at hand. I noticed a gentle contemplative or musing (as opposed to frenetic) quality to my thinking; memories mixed with imagination brewed harmlessly in the background just as the ingredients of my latest version of stone soup simmered. I learned things about myself, too. I discovered that I would much rather hand mince garlic than use a garlic press – and that I would rather individually chop my vegetables than use a food processor. I liked the feel of the food in my hands. I began to pay attention to the different spices called for in recipes and learned the joy of releasing the fragrance of fresh spices in a mortar and pestle (my favorite kitchen implement to this day). I noticed the colors in food and would create with attention to color as well as taste and smell. In short, I began to feel like a kitchen goddess. So, without further ado . . . let’s begin. 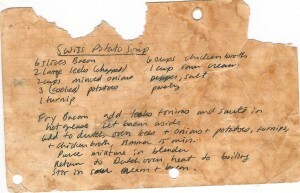 Today we are having Swiss Potato Soup. Just saying those words, brings a whole era to my mind and I think fondly of the many times I have pulled this recipe out. I have included it here below in its original form, which I wrote 28 years ago, because the mottled, torn, well loved, imperfect, handwritten index card tells something all by itself. And as I sit here now, ready to explain more and recreate it in a more legible form, I remember the woman who gave me the recipe. . .
She was my Greek and Latin tutor and at the time, I thought she was the coolest person I knew. (I was 22 at the time; she was about my age now) She was super hip with short red hair, a dynamite figure and a flair for style. She was warm and engaging, and absolutely dynamic. I wanted to be just like her when I grew up. She taught me Greek and Latin in the evening at her house down the street from UCLA. When I started taking her classes, she had just moved to a gorgeous little house on Westwood Blvd in Los Angeles. She gave me a little tour of her house and I remember being totally impressed that her four poster bed sat on hardwood floors in the dead middle of a sparsely decorated room that had a high ceiling. Behind and to the side of the bed were giant tropical plants of all shapes. The effect was like sleeping in the jungle. I remember too that she told me how her first husband had died suddenly from melanoma. The room was quiet and still when she shared that. And in that singular moment, she taught me about reverance. She taught me about cooking too. She sort of instinctively knew that I was struggling, living in my first little tiny house with my fiancé, on a budget and having to come up with dinners. She announced to me that along with Latin and Greek lessons, she was going to share a recipe with me each week. 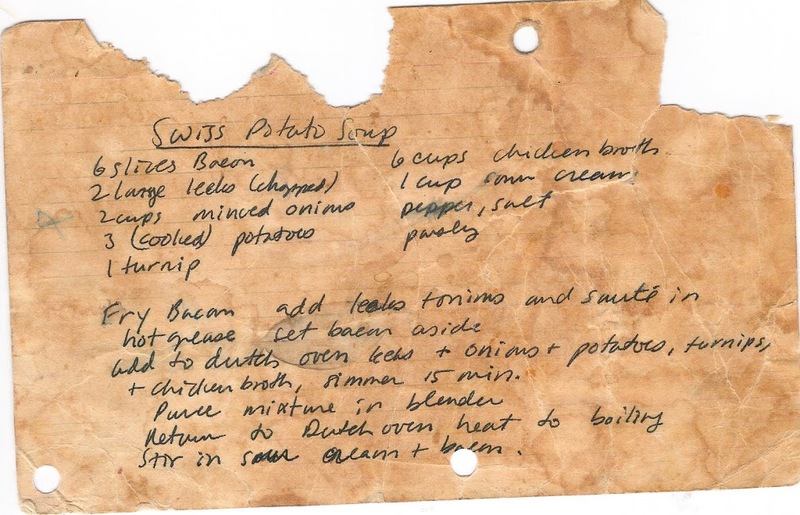 She said I should start with the basics, something simple and brought me into her kitchen and had me write down (on the index card you see below) her recipe for Swiss Potato Soup. So you see, whenever I decide to cook Swiss Potato Soup, as I do about 4 or 5 times a year it comes with the loveliest of baggage. I can’t help but smile. The memories of being a college student, of just starting life out, of the warmth and caring of others, they all come rushing back and I can’t help but think the soup is filled up with that too. Add to a dutch oven the leeks, onions, cooked potatoes (cut into pieces), turnips and broth. Stir in sour cream or yoghurt and bits of sausage, bacon or tempeh. Serve with bread. I like to make a special loaf of Bob’s Red Mill Hearty Whole Grain (Gluten Free) Bread. It is sooo yummy and goes well with the soup! Note this is a very handy recipe on its own–try making a BLT with it. It’s amazing; it tastes just like bacon! I learned with trick from a macrobiotic cook who lived with us for a while. It’s one of those recipes we come back to again and again.